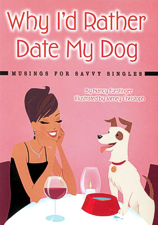 If you wonder why you can teach a dog to fetch but you can’t train a date to call you back, or you find that a Saturday night snuggled up with a furry four-legged friend often beats a night on the town with a two-legged date, this book is for you. A collection of wry observations, clever quips, and sly jokes. Why I'd Rather Date My Dog compares our human dates with our canine companions and explains why the dogs outclass the competition—paws down. The matchup of Nancy's sly jokes with Jamey Christoph's charming, urbane, and all-too knowing artwork creates a truly hilarious spin on the foibles and failings of the dog-eat-dog dating game.